Of the total amount of solid waste created recycling, reusing and composting are by far the dominant methods for disposal. In 2012 over 13 million tonnes was recycled or composted. Anaerobic digestion and creating biogas from these solids is currently undertaken in more than 100 locations. There are more than 200 composting sites across the UK and several thousand facilities where end of life vehicles are processed, dismantled and recycled. In fact recycling and composting has become pretty big business. Unfortunately a high proportion of solid waste still ends up in landfill. Just over 40% in fact. 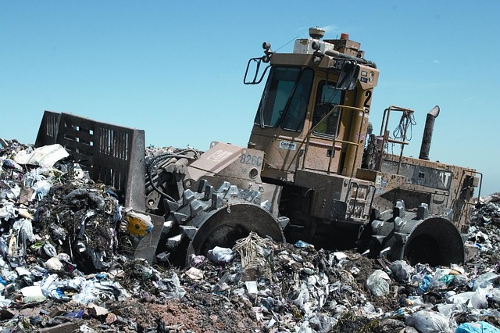 However the good news is that 1700 landfills have stopped accepting waste and this is a good sign that we’re moving away from using landfill in our waste management program. There are several processes, in various stages of development, that can be used to recover energy in one form or another. 16.1 % of solid waste is currently sent for processing and turning into energy which represents 5% of the UKs Renewable Energy Sources. The methods used fall into two categories: combustion and pyrolysis. Combustion involves burning the solid waste in order to produce steam. Pyrolysis is also known as destructive distillation. It involves chemically dissolving solid waste using heat in an oxygen reduced atmosphere. The result is a stream of gas that is predominantly hydrogen, methane, carbon monoxide, carbon dioxide, other gases and inert ash. Recycling has been undertaken for thousands of years. Metal tools and implements have long been melted down and made into something new. There are a number of ways this is achieved today that include shredding, magnetic separation, screening and washing. Another method is called wet pulping. Water and refuse is mixed together and ground into a slurry. Metal and nonpulpable materials are separated using a magnetic device and the remaining slurry is loaded into a centrifuge where heavier materials such as metals, glass and ceramics are separated out. The final slurry then goes through a paper, fibre recovery system and all that’s left can then be burned or sent for landfill. Currently collection companies are being encouraged to keep items such as bottles, cans, newspaper, cardboard and other recyclable materials separate from normal waste. With many local authorities operating a separate collection service alongside the usual kerbside collection. Saving time, money and resources in the disposal process. Here at 24/7 Waste Removal we are going to continue to help our residential and commercial customers improve their recycling levels by providing an affordable service wherever you may live. Together we can look at taking care of the environment and protect the future of our planet. This entry was posted in "The More You Know" on Saturday, April 22nd, 2017 by 24/7 Waste Removal.